While the potatoes are cooking, heat a skillet over medium heat. Add the bacon and cook until the fat is rendered and the bacon is totally crispy. Remove the bacon with a slotted spoon and place it on a paper towel to drain any excess grease. It will be used for the dressing! Spoon out about 3 tablespoons of the bacon grease to also reserve for the dressing. Throw the asparagus in the skillet and cook, stirring often, until it’s bright green and just crisp, about 3 to 4 minutes. Place the asparagus aside. 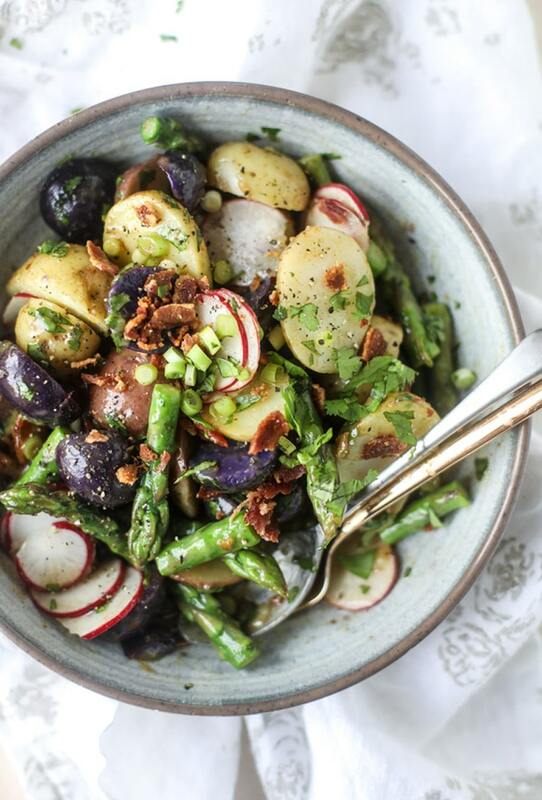 In a large bowl, combine the potatoes, asparagus, radish slices, green onions and a pinch of salt and pepper. Watch the salt here since the bacon is salty… and the dressing is salty. Toss the mixture with the hot bacon dressing. Sprinkle it with the chives. Taste and season additionally if desired. Serve! Add the bacon grease, minced garlic, vinegar, sugar and mustard to a saucepan over medium-low heat. Whisk constantly until the sugar has dissolved and the dressing slightly emulsifies. You can keep this over low heat while stirring occasionally until ready to serve. Season with the salt and pepper. Before serving, add in the crumbled bacon.